Anthony (Tony) Underhill was born in Sydney, studying at the National Art School in 1939 before moving to Hobart where he studied at the Technical College; then after a stint as a semi-official war artist with the Australian Army serving in New Guinea 1942-43, he went to Melbourne, studying at the Technical College (later RMIT) 1945-47. In 1948 Underhill left for England, where he remained the rest of his life, occasionally exhibiting in Australian Galleries and Gallery A. In London his career as artist and teacher flourished, earning admiration for his lively post-impressionist style with a figurative emphasis. He then evolved into pure gestural abstraction by the early 1960s until finally returning to a more emphatic, English-infused figuration in the last phase of his career. 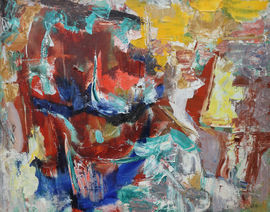 He was an outstanding colourist, combining a subtlety and confidence which elicited the praise of Kenneth Clark when he saw these two paintings in particular, typical of the artist’s work included in Bryan Robertson's 'Recent Australian Painting' show at the Whitechapel Gallery in 1961; then in the Arts Council touring version, 'Commonwealth Arts Today', shown at the New Commonwealth Institute. Underhill earned a certain international cache through exhibiting in England, Spain, Italy and in Germany, where the West German government sponsored a touring show of his work to three cities of the Ruhr region. He spent much time and energy helping and encouraging Australian painters in London, such as the younger generation of Brett Whiteley and Michael Johnson, who loved his wit and combative intelligence. Indeed he became a successful teacher with prestigious posts such as a visiting professorship at Iowa University and Professor of Post-Graduate studies at Birmingham Polytechnic.